Doors World puts a lot of information on the front page to go through. The sidebar on the left allows you to search by category or need, including by door sizes! The sidebar on the right, offers the latest deal of the week and shares some of the smaller items that many people would usually forget when looking at buying doors. Once you get to the middle section, you have the ability to shop by door type. The images help to shop quickly and easily, making the site a lot more user friendly. With each image also brings delivery options. You can opt for next day deliver or choose a specific day to work in with your DIY project needs. At the very top of the page is the menu, and the section to learn more about your delivery options. 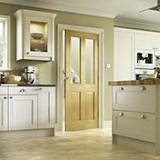 Doors World makes it clear that there is free delivery available for any order over £50, which is very easy to do when you’re buying doors! It also reiterates the ability to choose your preferred date or get next day delivery. Overall the site couldn’t be better, except for maybe having the left side bar a little shorter with drop down options for specific searching.